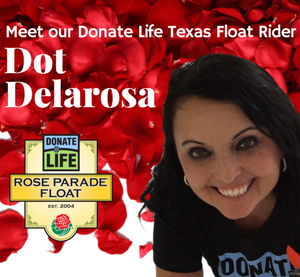 On New Year’s Day, Dot Delarosa of San Antonio will represent Donate Life Texas on the Donate Life Rose Parade Float in the 2018 Tournament of Roses Parade. Tune in to watch January 1st, 10 a.m. CST on ABC, NBC, Univision, HGTV, or the Hallmark Channel. Let’s get to know Dot as she shares her story and how receiving the ultimate gift has made a difference in her life and all those she inspires. Born into a family of ministers, Dorothy “Dot” Delarosa had a heart to serve others. A vibrant young woman, by 36 years-old she had it all: A beloved preacher at her church, success, strong role models, and love. She was well on her way in her mission to make a difference. Little did she know that soon her faith would be tested. It was during this time, Delarosa noticed an unusual cough that left her breathless when she spoke. As time passed, family and friends became concerned when they noticed Delarosa struggling to breathe, their persistence prompted her to seek answers from doctors. For years she was told she had asthma, then bronchitis, even with antibiotics, nothing was working! In 2008, it was time to see a lung specialist. In shock, Delarosa did not know what a transplant meant, or could understand how a simple cough meant she would die. She went in for a lung biopsy and tests. What should have been a short stay in the hospital turned to 26 days of surgeries, complications and a near death experience. The lung biopsy proved she was suffering from Idiopathic Pulmonary Fibrosis (IFP). And, her only hope – the gracious gift of a new lung. With her lung capacity at only 25%, Delarosa was ready to fight for her life. Eighteen months after being diagnosed, on June 7, 2010 Delarosa received the most precious gift ever received from the most generous person. A healthy, new lung. The transplant was a turning point in her life. Today, Dot remains a minister at her church in San Antonio and serves on the Mayor’s Prayer Counsel, but with her first breath came a new mission to honor her donor, inspire hope to the 11,000 Texans waiting and share about the importance of organ, eye and tissue donation. Since 2010, Dot dedicates her time sharing her story through several notable organizations: Texas Organ Sharing Alliance (TOSA), University Transplant Center, San Antonio Eye Bank, Pulmonary Fibrosis Foundation, and more. In 2014 she was awarded TOSA’s Joan Wish Volunteer of the Year Award for her volunteer efforts and last year, she made a video to help promote donation during the Donate Life National Donor Sabbath observance. Previous Previous post: DLT: 10 Million & Counting!